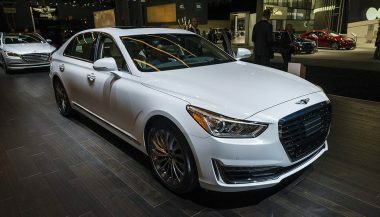 The 2019 Genesis G70 2.0T is the freshest luxury sport sedan on the block. 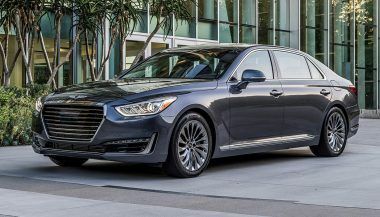 The entry-level model from Hyundai’s recently spun-off Genesis luxury brand. It competes for your dollars against a slew of well-established competitors from Audi, BMW, Volvo, Cadillac, Mercedes, Lexus, Acura and (many) others. 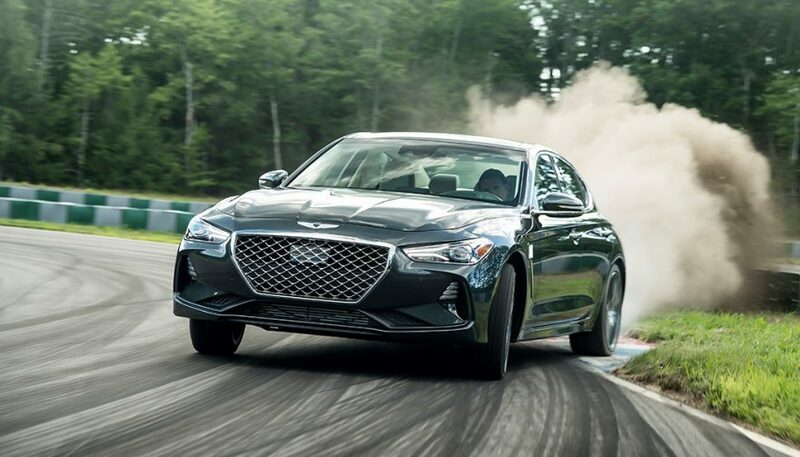 And while Genesis hasn’t been building luxury sport sedans for decades like all brands with which it competes, G70 remains a machine that should be on your ‘To Test-Drive’ list if you’re shopping in this ballpark. Genesis is hoping to get noticed, in no small part, for how they do things a little differently. For instance, Genesis will send a representative to you with a car to test drive upon request. Provided you live in or near a major centre that they service. That representative will deliver the car to you if you buy. And will even come back to retrieve it for servicing. Leaving you a loaner vehicle, when required. The brand figures time-saving perks like these will be popular with modern luxury sport sedan shoppers. You never have to go to a dealership. Like ever. My test unit was the fairly-rare 2019 Genesis G70 2.0T Sport. Most models sold get a twin-turbo V6, automatic transmission, and All Wheel Drive (AWD). But my tester took a different route that should resonate strongly with those after a pleasing driving experience on a budget. A 2-liter turbocharged four-cylinder with 252 horsepower was teamed up with a 6-speed manual transmission. Along with rear-wheel drive, a set of big Brembo brakes, and some sticky tires. Still, neither the availability of a manual gearbox, nor the time-saving concierge-based sales experience, are the main reasons to check a G70 out if you’re in the market. By my estimation, this car’s most valuable and compelling asset is how it feels and responds. Steaming down the highway at a good clip, the G70 feels like it weighs 6 tons: heavy, dense, solid and bolted to the road. 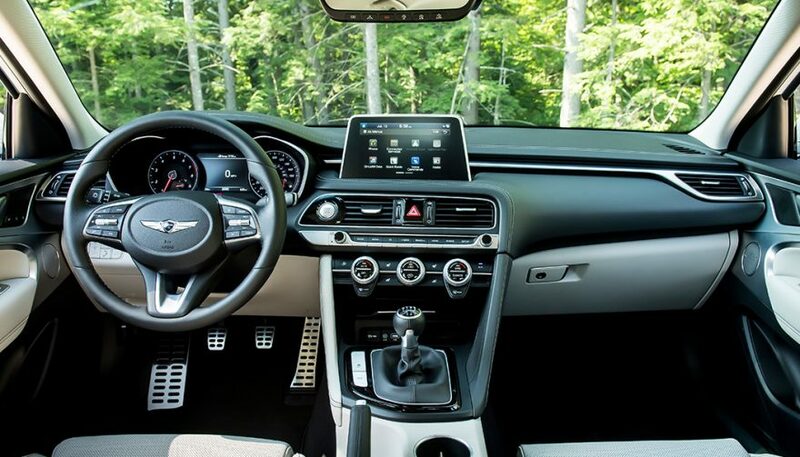 Dial in some instructions via the controls, and the heft vaporizes, leaving the 2019 Genesis G70 2.0T feeling surprisingly lean and light. It’s heavy while cruising, but eager to any further instructions like a lighter and friskier machine. This is a hallmark feel of a great luxury sport sedan, and it’s here, in full. Steering is excellent, easily matching or surpassing the best in the segment. Specifically, the action at the steering wheel is liquid-smooth and weighty but deployed via a very fast ratio. Minimal inputs therefore generate big reactions from the car, which you direct with your wrists, not your arms and shoulders. The result is a laid-back, low-effort cruising experience, and a playful dynamic when pushed on winding roads. All said, this steering feels very well calibrated and expertly dialed in. Ditto the suspension and ride. The G70 tackles highway drives with comfort, rarely smashes into potholes, and feels softly-sporty and comfortably athletic at virtually all times. Even rougher roads do little to increase unwelcomed suspension noise in the cockpit. Driven with intent though, the body keeps neatly suspended over the wheels. With minimal unwanted body motion, minimal residual rebounding, and little indication that the machine is battling its weight. It’s sporty and spirited handling that co-exist nicely with a ride that’s not too squishy, and not too harsh. Stopping force from the brakes builds and swells predictably and proportionately once the pedal is pressed a little past its first inch of travel. 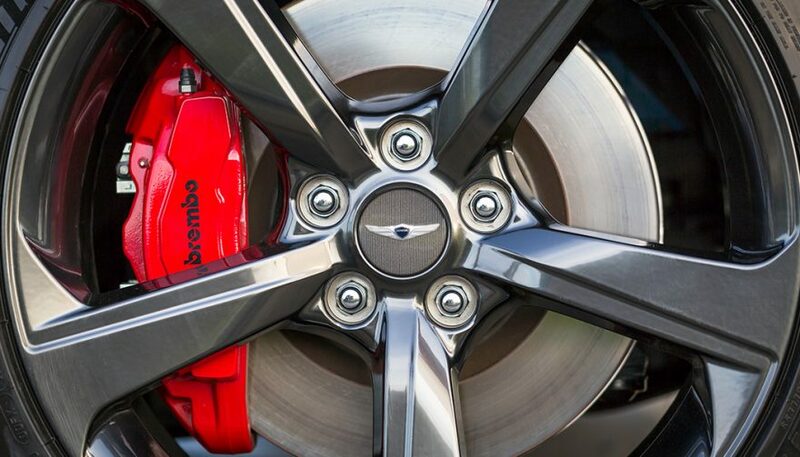 The brakes feel most eager and precise when worked aggressively, and like the steering and suspension and handling, feel expertly calibrated to perform with a fine-tuned feel, and confidence to spare. The two-litre engine exhibits a dab of full-throttle turbo lag before flinging the 2019 Genesis G70 2.0T down the way with oomph. It’s a smooth and fairly muted performer with generous torque for plenty of quickly-available power in virtually any part of the rev range. Driven in no particular rush, there’s a distant hum from the engine room. Pushed, the sound is smooth and relatively quiet, though also relatively ordinary. The springy and heavyset clutch will find favor with the driver who prefers the pedal action of a sporty clutch, and not a heap of steamed kale. Some will find the shifter a too springy and lumpy. And learning the foot-and-arm cadence needed for smooth shifting may take a day or two before becoming second nature. To your writer, the manual six-speed transmission here is more pleasing because it’s available than for how it feels. On board, colors and textures and patterns and work towards a fresh and high-energy appearance that also flaunts quality and craftsmanship. A no-BS infotainment interface, comfortable seating, decent visibility, and generous nearby storage and charging help add further appeal. Metal accents and optional red-stitching set against black quilted leather smack of swankiness. 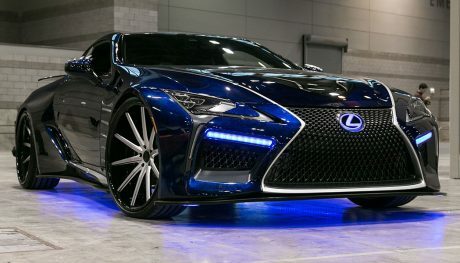 Feature content included a (very) potent Lexicon stereo, panoramic roof, push-button start, adaptive steerable LED headlamps, and more. Complaints include rear seats that are just adequate for use by average-sized adults. Taller or more long-legged rear-seat occupants are unlikely to find enough leg or headroom. Further, though much of the styling and trimmings are unique to Genesis, numerous Hyundai components are scattered throughout the cabin. 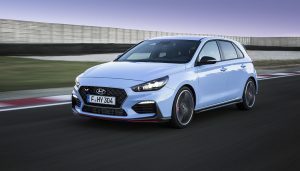 As such, those upgrading from a Sonata, Veloster, or other recent Hyundai will already be familiar with a good portion of the cabin’s finer details. Including the switches, stalks, and entire infotainment system. This may detract from the upgrade factor for some shoppers. Some passengers, further, also expressed surprise at the inclusion of a simple, manually-adjustable passenger seat within such an upscale-looking cabin. Ultimately, the 2019 Genesis G70 2.0T remains a highly-compelling package, thanks to dynamics that strongly challenge the big players in the scene, a fine-tuned feel throughout, and highly-compelling all-in pricing from $34,900 USD—including delivery to your doorstep. 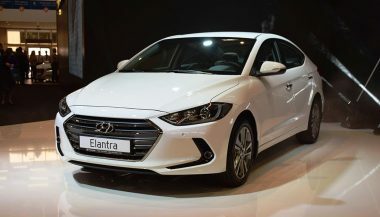 The all-new 2017 Hyundai Elantra Sport has just been unveiled, and it’s bound to level the sport compact playing field just a little.